Are you serious about podcast? The 2nd Annual Podcast & Portable Media Expo is the only industry event that brings together influential podcasters, media, corporate executives and device makers to cover the complete range of business, marketing and legal issues for audio & video podcasts and portable media. Place and time-shifting technology is changing the business landscape of media. The Expo is also about the new trend of individuals participating as media companies and producing content at broadcast quality. Date : 29 & 30 Sept. Check out their keynote and conference speakers, you will be amazed that it is indeed happenning, the change of face in personal media and bussiness communication. * Olive Films- good place to find independent and film arts features. You can find lesser know directors but award winning film, esp. documtentary. * Microcinema Internationaloriginal an arts group, very good responsive online shop. Selection from mainly US famed and popular labels, very little rarities or collectors items. They have education liscence on some titles. * INDEX DVD- Austria label focus on experimental film, video art, mainly european artists. Pay via paypal- not really user friendly. * Argos Belgium's very good distribution of artist video and film for screening and education. some good example for video and performance. * Palm Pictures-famous for relating to MTV channel, selection is not totally for MTV generations. * Onedotzero Festival DVD : yearly selection of short video, ad, motion graphics and MTV from UK. * resfest Festival DVD : US yearly selection of short video, ad, motion graphics and MTV. DVD magazine/ publisher for fans and industry workers'reference- good entertaining stuff, some of them are publishers too. * You work for them- some selection from Japan artists, VJ, MTV and designers film. 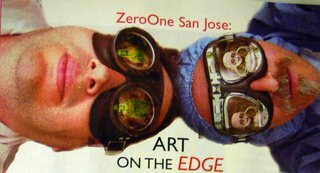 * ASPECT magazine- US west coast new media festival selection.Documentary on artists' sculptural and installation works. Useful commentary from well- known art critics and curators, good for teaching and self entertainment. A new serach engine is born in Hong Kong that claimed itself to be more community directed. You can use my search engine build by swicki to search for new media art and other cultural experiments in technological world. Simply copy and paste link in your blog. I am refining the search by using it or guiding it so you can also join. There is a need for Campus TV teacher to serach teaching materials and examples for student. I reckon it would not be easy if you just search by keyword on any search engine.It will be time consuming and would not hit the right link for you. The smart way is to make use of some smart web 2.0 social tagging technology. Try this del.icio.us. It is now a yahoo free service that was originally developed by art people, or creative art people that know IT well. In this social bookmarking service, members contribute their bookmark publicly. Most of them will have very specific interest or POV bookmarking. So if you want education, you will be linked to many relevant but widely diverse bookmark. You can also check who is tagging the bookmark, how they comment on it and what are the other bookmark on the same tag, so if you find someone that has a tagging habit near you (i.e. looking at similar things), you can simply tag this person. You can search for what you need in the tag search but also from people search and their link. You can check how popular a tag is which means this serves as an index to how useful it is. I can open a collective account (give out password to all) so that we can share it in class. Or open your own and send us your account name so that I can link them up. Check out who is tagging http://www.ubu.com/, you will find interesting people and link. from this bookmarking. Well, day 1 is exciting, too exciting to list down the thing. Picture speaks a thousand words. The black mark is I left the signal processing workshop very early on. Sonia took all of us to a sound walk and back for some DIY microphone making. I think attending other engagement is important. During the sound walk, I know that I am sorry that I did not chose wet lab. See we-make-money-not-art to know more. I am also going to the Pacific Rim New Media Summit. More friends and unidentified persons, RAQs media collective is doing a english literature to mythsified the Pacific Rim, geography, history, network technology, at the end they summarize by suggesting Pacific Rim becomes a submarine "isolation like the container, inability to distinguish outside and inside" Very different to the other but also avoiding conflicts and direct confrontation to issues. I will be going to HK show next. 7 Aug : Container Culture show opens- HK's Annie Wan add oil!! 11 Aug : ISEA 2006 -Pacific Rim New Media Summit. I hope Hung Keong is the Hung Keung that HK knows. Lynn Hershman's critical documentary based on Critical Art Ensemblem member, Steve Kurtz who was charged by FBI as bio-terrorist. With cast like Tilda Swinton, Peter Coyote, and original score by the Residents!! 12 Aug : ISEA- Community Domain- hosted by my friend, Alice Jim. She must have freak out for this. then fly back to HK right from the spot. The Convention on Cybercrime is a sweeping treaty that has been waiting in the wings of the Senate for nearly three years. Now the administration is putting pressure on the Senate to ratify it in the next two days. If it does, it would mean the U.S. would enforce not just our own, but the rest of the world's bad Net laws. Call your Senator now, and ask them to hold its ratification. The treaty requires that the U.S. government help enforce other countries' "cybercrime" laws - even if the act being prosecuted is not illegal in the United States. That means that countries that have laws limiting free speech on the Net could oblige the F.B.I. to uncover the identities of anonymous U.S. critics, or monitor their communications on behalf of foreign governments. American ISPs would be obliged to obey other jurisdiction's requests to log their users’ behavior without due process, or compensation. The treaty came into force last year on the international front, but not in the US, where it needs to be ratified by Congress first. So far, ratification has been blocked thanks to a "hold" placed by conservative lawmakers. But Republican senators this week are now being heavily pressured by the administration to drop their objections, and let it fly. Ratifying the Cybercrime treaty would introduce not just one bad Internet law into America's lawbooks, but invite the enforcement of all the world's worst Internet laws. Call your senators now, and tell them to hold this invasive treaty at bay. Isn't it romantic. Here comes Mars. It will look as large as the full moon to the naked eye. This will culminate on Aug. 27 when Mars comes within 34.65M miles of earth. Be sure to watch the sky on Aug. 27 12:30 am. It will look like the earth has 2 moons.